One of the newer fruit trees on the market is the Jujube tree, also known as the Chinese Date, or simply red dates. This is drought tolerant tree, is grown for the fruit. A number of varieties are available for sale with Li, which has rounded fruits being among the most popular. Lang and Chico are also popular with Chico performing better in hot dry climates and Li more suited to cooler areas. If you are lucky enough to have one of these growing you can pick the fruit and eat it straight from the tree, it is sweet and the skin is edible. 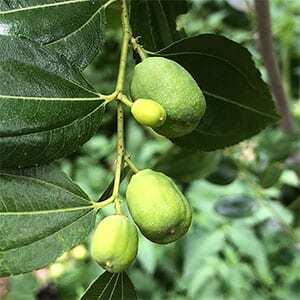 These are a small to medium sized deciduous tree growing to 6-10m depending on conditions and cultivars with the ‘So’ variety have a dwarf habit. The fruit itself has low acidity, and is rich in vitamin C iron and calcium when fresh. 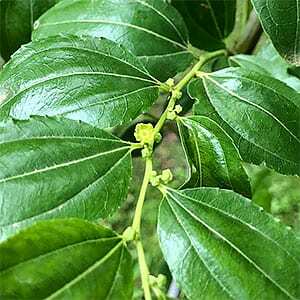 Attractive small yellow flowers in spring are fragrant, the foliage is glossy. The fruit has been used in Chinese medicine for many years. The dried fruit is used in baking as well as being candied. The fruit is also used to make wine, Hóngzǎo jiǔ ( 红枣酒 ). Jujube Tree or Zizyphus jujube, are best described as looking like a cross between an apple and a pear with a single pip or stone, although sometime no pips are found, sometimes two. These trees can send up suckers if the roots are disturbed. They can grow reasonably tall, to 5 metres plus, however are usually pruned to less than this when grown for fruit. Most varieties do not need a cross pollinator so are excellent for the home garden. Jujube Trees require a hot ripening period and do require water during the fruiting period although otherwise they are reasonably drought tolerant. Prune in winter to maintain a smaller tree and increase fruit production Jujube fruit is eaten fresh, dried or candied and is said to be high in vitamin C. They are also known as the Chinese Date. For best performance provide the following care and growing conditions. Very tolerant of both cold and warm climates, they will grow easily in Melbourne and also in Brisbane. High humidity can be a problem as trees grown in these climates are more susceptible to disease. They are a deciduous tree that can be pruned to size in winter. generally regarded as fast growing. As most varieties are grafted onto a different rootstock to improve vigor you will need to watch for suckers from the rootstock. These suckers can be a little invasive. We suggest growing Jujube trees in containers for root and sucker control.